In this fun, interactive, and incredibly helpful 4 week program, two writing industry vets teach you just what you need to know to become a professional writer and get paid working from home in today’s rapidly changing industry, even if you’ve never published anything before! If you have a dream of being a writer, we can help make that dream a reality for you, starting today! Exactly Who Will Hire You As a Writer! How to Access Markets that Most Writers Don’t Know How to Approach! How to Send Decision Makers Proposals That Are Easy to Say “YES” to! How to Make Yourself Marketable, Build A Platform, and Get Noticed In A Crowded Marketplace! Making a living as a writer is absolutely possible and anyone can do it, even if you’ve never shown your writing to anyone before. Good news… it’s NOT about having a writing degree. No Siree. It’s simply about understanding the industry and doing the work, once you know how. This course is for anyone who wants to make a living as a writer, and we mean ANYONE! Including you! Imagine the pride you’ll feel when people ask what you do for a living, and you can honestly and proudly reply with “I’m a professional writer”! If that sounds good to you, then register today, because we are passionate about your success in today’s writers industry, and locking in your seat in this class is the best and fastest way to do it with our help and guidance. Jennifer Swanson is the author of over twenty books including nonfiction and fiction titles. Her work has received both awards and starred reviews. Jennifer writes about everything from turning an idea or a product into a service to books about invisible creatures in your body. She has worked with over 14 different publishing companies including Capstone Press, ABDO Publishing, Britannica, National Geographic, and Charlesbridge. This makes her a highly sought after professional writer and with her Masters Degree in K-8 Education, she is also an expert in showing others how to become sought after writers too. Dr. Mira Reisberg is an award-winning and best-selling children's book illustrator and writer. She has helped MANY authors and illustrators get published. As the founder of Children's Book Academy, her passion and expertise is helping writers and illustrators succeed with numerous writers' and illustrators' courses. Mira has also worked as an editor, an art director, a literary agent, and taught both graduate and undergraduate courses in children literature as a university professor. Consequently, with 27 years of experience in the field,she knows the industry from just about all angles. Mira holds a PhD in Education and Cultural Studies with a focus on children's literature. If you have the motivation, these two writer’s coaches and industry professionals have the processes and insights you need, all delivered in a fun, supportive, safe online class environment. 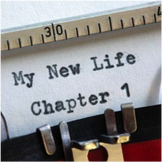 This course will give you exactly what you need to succeed, with no fluff or filler. Perfect for busy professionals, stressed-out moms, or anyone who has a busy schedule and wants help fast. All Delivered Quickly, Affordably and with a Whole Lot of Fun in the Process! The course is 4 weeks, but you’ll benefit and continue to learn with access to our members’ website for an addition SIX full months plus indefinite access to our private supportive Facebook group!! By enrolling for this fun “Writing for Love and Money” course with Mira and Jennifer, you can truly begin making your living as a writer. And Most Importantly… The Knowledge of Where To Find Meaningful Paid Writing Work in Both Trade and Educational Markets! All of this is delivered over 4 weeks during the live weekly training webinars that you’ll enjoy participating in. In addition to the live training webinars that you can watch from the convenience of your own home (which will be recorded for anytime replay), you will be provided with the perfect scripts, templates, and checklists that will help you get started to reach new markets as a children’s writer. Plus, Mira and Jennifer are going to coach you individually to help you with your pitches, packages and proposals so you can get hired. With the right tools and coaching, it can happen. We’ll even support you with your plots, titles, and endings. In fact, on the coaching calls, you can ask any question you like! 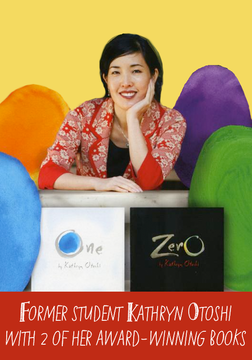 There is no other children’s writer’s income program like it, and spots are limited. Limited Pricing Available: The special $397 pricing applies to the first 20 students only. This great price also includes an extra bonus worth 149 where you will receive the must-have Scrivener Writing Course, which will not only help you with writing but also with drafts, revisions, resources, character information, plot, tracking query or cover letters, and so much more all in one handy place. And for the first 7 to sign up with either Jennifer or Mira, we have a very limited number of individual one-on-one critique or mentoring sessions at the special price of only 497 for the course and critique. After these spots are filled the investment is a mere $497 with critique options for 579 and worth every penny. Add the great news is that payment plans are available. You cannot afford not to attend this class if you really want to be a writer, and you may even make your investment back on your very first writing gig! 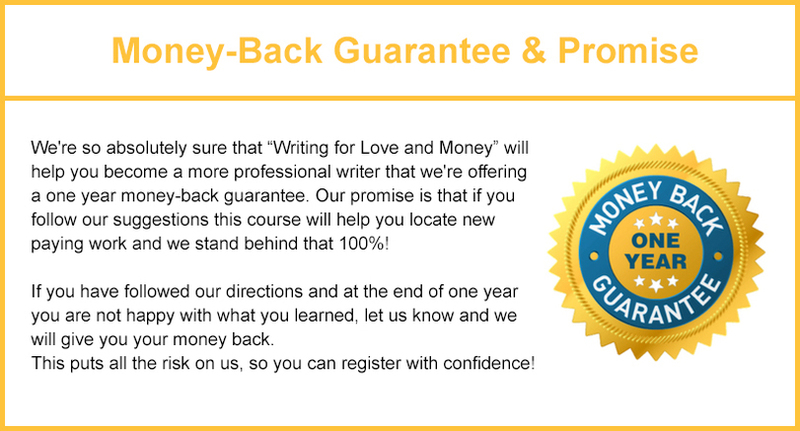 “Writing for Love and Money” is just $397 when you register today, and you’ll get these bonuses to help you make it that much easier to become a well-paid writer! Bonus 1: All the course templates, scripts, checklists, and materials for the 4 week course plus an additional 6 months of access. Bonus 2: Lifetime access to our fun, private Facebook group to receive the feedback and support to help you be successful. Bonus 3: Your own critique group where you’ll get extra support with a group of fellow students who help provide feedback and suggestions for improvement. Best of all, we’ll send you preliminary material to work on so you can start making progress TODAY! The First LIVE TRAINING BEGINS MAY 18th, 2015, so register right now to get early access, the discount, and all of the special bonuses! Answer: Yes! When you register today, you’ll get all of the bonuses and save $387 on the tuition! This can only be guaranteed today, not tomorrow. Plus, with our money-back guarantee, there’s no risk so you can register with confidence and peace of mind. Answer: Absolutely with an individual critique session with Jennifer or Mira, our weekly live (and recorded) webinars, our interactive Facebook page, and the optional small critique groups. Answer: YES, this is a very content rich course. We will be doing everything in our power to help you succeed. Q4: Who is this course NOT for? Answer: This course is not for you if you think your work is already perfect or if can’t see the value of learning from 2 master instructors who have over 38 years of combined experience in the children’s book industry that they've put into creating this unique and innovative course.